If you want some more info on it, see here. I don’t think I have a copy of the program, so if someone does, send it my way and I’ll host it here. I’ll try to find the tool and make a playthrough. I just need to know how to take screenshots. I was seriously just thinking about this yesterday. I was looking all around for it way back when out of desperation. I figured if nothing else it would give a general idea of what was going on. Wow that thing is awesome! I would love to play through Mother 3 with that thing! Cool. Engrish forever! Crap, that post above was me….. Seems like people were having problems getting it to work, but it’d still be great to dig it up and have a playthrough with it. That was done with… Multimedia Fusion ? NOW that’s awesome ! That is amazingly clever. I was content to wait for Mato’s translation patch, but that is really cool. Kudos to Illuminum! cool, but why need this when we have a brilliant translation right now……. GoldenEevee: Engrish is as funny as hell! What on Earth is even going on in the game in that screenshot…? 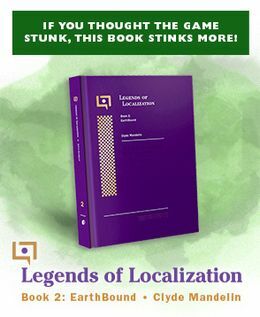 Someone needs to make a program like that for Mother 2. 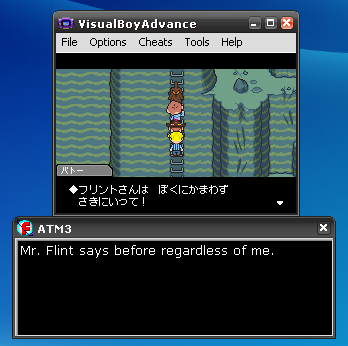 Mr. Flint says before regardless of me. Perhaps someone could try and contact the member who made the program. Wait, what’s going on in the screenshot? Is it using changed sprites? “! 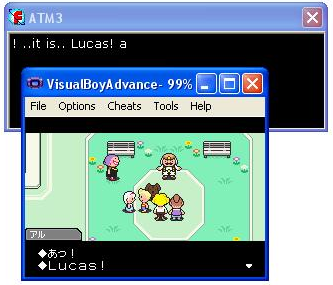 ..It is.. Lucas! a” – The second one is great too. That screenshot is from Chapter 1 after Duster makes the Wall Staple ladder. Bateau tries to climb up the later but has a fear of heights and freezes, basically just a way to block Flint from going down the ladder to force him to go fight the Reconstructed Caribou. Haha! Reminds me of when I try to read Hello! Project blog translations w/ Google’s translator. Dunno if people saved the pics, but the discussion was here. Does anyone have a working link to this application? Also there were similar mod to some SNES emulator, where it took text lines from game memory and feeded them to auto translator. I wish I knew about this 3 years ago instead of now! It’s Nice, BUT WHEN THE HELL ARE THEY GOING TO DO THIS FOR MOTHER 1+2!!! it’s for all games of gba or no?